In Honor of all CRNAs – Happy CRNA Week 2019! Certified Registered Nurse Anesthetists (CRNAs) are some of the best people to work with in the healthcare industry. In honor of CRNA Week 2019 (Jan. 20-26), we thought we’d share a little about them. Nurse Anesthetists have been the main providers of anesthesia care to U.S. military personnel on the front lines since WWI. Furthermore, we have found that CRNAs are amenable to change and passionate about improving the practice of anesthesia, safety, and patient outcomes. They tend to be a group of people that is amenable to change and open to new methods that lead to positive progress. CRNAs also hold a special place in our hearts here at Graphium Health, as well, because many provide anesthesia in the Rural Health community. One of our goals is to keep our costs as low as possible so that we can deliver the best anesthesia technology to organizations of any size or case volume. CRNAs who work in the Rural Health community realize that same goal and deserve both recognition and a huge thanks! As with all anesthesia providers, however, CRNAs are often overlooked…or simply forgotten. Patients may not even remember their anesthesia provider and, in our experience, technology vendors often only consider anesthesia secondarily, if at all. It’s no wonder that physician burnout becomes a reality quickly in such environments. So, we are thrilled to be a part of celebrating CRNA Week 2019. CRNAs: you deserve it! Thank you for your hard work and dedication to those you serve. And, thank you for being the down-to-earth, open-minded, proactive, and kind group of people that we continue to experience on a daily basis. Swag designed JUST for CRNAs. 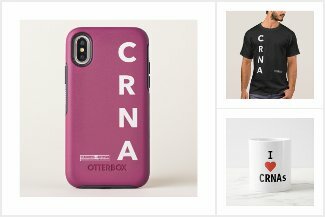 As a thank you to the CRNA community, we’ve added a few pieces that are just for you. Your hard work and dedication deserves so much recognition.